The 1997 NBA Eastern Conference Semifinals between the Miami Heat and New York Knicks was a best-of-7 war, loaded with incredible performances, fights, and everything else that make Heat-Knicks rivalry so great. On May 9, 1997, they met for Game 2, which the Heat were able to claim, squeaking by in a 88-84 win. Perhaps the biggest factor in Miami&apos;s win was point guard Tim Hardaway, who had 34 points, 8 rebounds, and 4 assists. The Heat would go on to win the series 4-3, before losing 4-1 to a Michael Jordan-led Bulls in the following round. 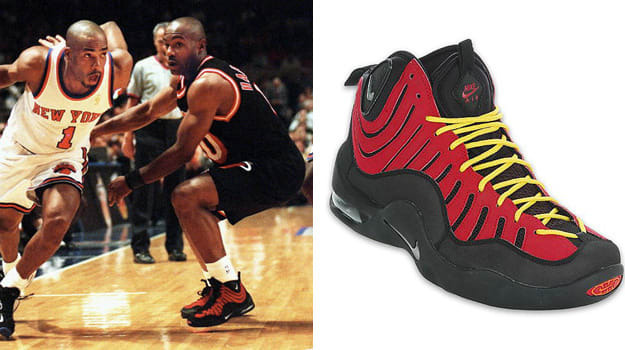 During this series and much of 1997, Hardaway was laced in the Nike Air Bakin&apos;, which was seen as his unofficial signature shoe. Draped in unmistakable red-and-yellow, the Air Bakin&apos; featured a visible Air Max unit in the heel and a breathable upper. Its retro releases have been popular with players and collectors alike, although you&apos;ll have to hunt on eBay to find a pair now.